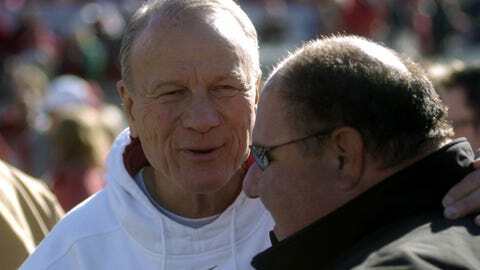 Mark Mangino (right, speaking with former Oklahoma coach Barry Switzer) was KU's head coach for eight seasons. AMES, Iowa (AP) Mark Mangino is getting another shot in the Big 12. Iowa State thinks Mangino can help engineer a turnaround similar to the one he keyed at Kansas — before it all went wrong with the Jayhawks. Iowa State coach Paul Rhoads announced Monday that Mangino has been hired as offensive coordinator. Mangino replaces Courtney Messingham, who was fired after the Cyclones finished 3-9 last season. Mangino coached Kansas for eight seasons, winning national Coach of the Year honors in 2007 and leading the Jayhawks to a win in the Orange Bowl. But Mangino left after the 2009 season amid accusations that he treated his players poorly. Rhoads, whose passionate defense of his players has put him in the national spotlight more than once, said Monday he was confident Mangino was the perfect fit to help Iowa State revive a languid attack. "As I speak of recruiting being very important, I think what’s always at the top of my list is somebody that cares about the welfare and the well-being of our student-athletes," Rhoads said. "There wasn’t a player, an administrator, a coach, a colleague that I talked to that had anything negative to say about Mark in that regard." Mangino’s ugly split with the Jayhawks remains the most memorable moment of his career. But his departure from Lawrence — and subsequent three-year hiatus — obscured a largely successful career as an assistant and head coach in the Big 12. Mangino got his collegiate coaching start at Youngstown State (1985-86), working for Jim Tressel. Three years later, he was hired by Bill Snyder at Kansas State and the Wildcats won at least nine games his final six seasons in Manhattan. Mangino joined Bob Stoops’ first staff at Oklahoma in 1999. He was promoted to offensive coordinator the next year and helped lead the Sooners to a national title. His eight-year tenure at Kansas included a remarkable renaissance. Inheriting a program with six consecutive losing seasons, Mangino turned a two-win team his first season into Orange Bowl champions five years later. After Mangino went 12-1 in 2007, he was given a big raise and contract extension through 2012 and honored as AP’s national Coach of the Year. "He brings 19 years on Big 8/Big 12 experience, first of all," Rhoads said. "This is a guy who was part of turnarounds at Kansas State. A guy who was the play caller for a national championship team at Oklahoma and took Kansas to unprecedented heights. … He knows how to run it. He knows how to pass it. He knows how to take advantage of the personnel he has in place." Mangino resigned in 2009 with a 50-48 mark at Kansas and four years left on his contract, worth $2.3 million per year, or a total of $9.2 million. He and the school reached a $3 million settlement. Mangino walked away from football after that, most notably to help his wife successfully fight breast cancer. Rhoads believes the chance to get back into the Big 12 will light a fire under Mangino — and the Cyclones could certainly use someone with his expertise. Iowa State scored 24.8 points a game last season. "I think that time of reflection, that chance to evaluate and observe some other things (helped quite a bit)," Rhoads said. "I think he’s at a very good point in his life because of those three years."